Can't believe there isn't more interest in this show it's absolutely brilliant! Unless I’ve another clash in the diary I’ll attend so please pencil me in for usual track and stand. I’ll check later. Just paid for 7 people in 3 cars. That will be me, Caren and joe in a RX8, Scott and Will in a Honda Integra and Ross and Mudge in a Renault Clio. Please add me to the list. 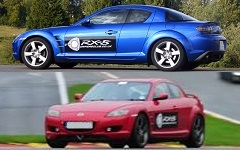 RX8 R3. Cheers John. Are we planning track session(s)? If so - which and what's the cost? I *might* end up with Wifey at this one! Can I get a spot on the stand for my rx8 kuro. Will get tickets now but they are till showing as £13 not £16? Hi. We can make it. Shall sort payment for tickets now for myself and misses. Going to get track time for myself too. What track sessions have people booked so can get out at same time? Sorry I had to bail on this... My car's effectively off the road since the prang last Tuesday... The Undertray has come loose as well - declared not roadworthy by Insurance Co. and no idea how long it'll be off the road for repairs!